Yoyogi Park (代々木公園, yoyogikouen) is one of the largest parks in Tokyo, located adjacent to Harajuku Station and Meiji Shrine. It's a very popular spot for Japanese street performers and huge free market on weekend. The street performers you can enjoy here are dancers, buskers, painters or actors. 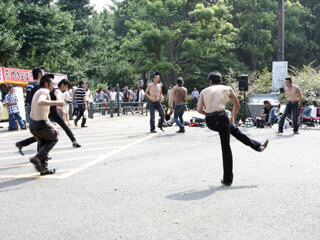 Especially, the rock dancers at the entrance of the park are very famous. You can enjoy their dance with 70's fashion. Also, on the side street, there are many indie bands and musicians are playing music. In the park, you can also find many drummers performing. The free market in Yoyogi park is the biggest free market regularly held in Tokyo. There are many food stands and catering. So, you can visit here with nothing, enjoy the performing, shop at free market, and eat, drink and relax at the least of the park. Parking and restroom are available. No BBQ allowed. Enjoy all kinds of Japanese street performers, especially check out the rock dancers. Their fashion is so great. You can see what the one aspect of 70's in Japan. There are many musicians who might become next rock stars in Japan. At the free market, you can also enjoy eating various kinds of asian food. What is now Yoyogi Park was the site of the first successful powered aircraft flight in Japan, on December 19, 1910, by Captain Yoshitoshi Tokugawa, following which it became an army parade ground. During the postwar occupation, it was the site of the Washington Heights residence for U.S. officers. It later was selected as the site for the 1964 Summer Olympics, and the distinctive Olympic buildings designed by Kenzo Tange are still nearby. In 1967, it was made into a city park. Today, the park is a popular hangout, especially on Sundays, when it is used as a gathering place for people to play music, practice martial arts, etc. The park has a bike path, and bicycle rentals are available. As a consequence of Japan's long recession, there are several large, but quiet and orderly, homeless camps around the park's periphery. Recently, Tokyo Governor Shintaro Ishihara announced plans to build a stadium -- with room for 100,000 -- in Yoyogi Park in order to host the 2016 Summer Olympics.